Tomorrow is the big day and Katy will be taking her state board exam for teachers in South Carolina. I am proud that Katy has overcome the many obstacles that she has had to endure to get to this point. Katy finished her B.S. degree at University of Texas at Austin in 1984 and she recently completed her Masters degree in Special Education and Cross Category. She is now working on her second Masters degree which is Curriculum instruction Reading. Ask me if I feel like a mental midget next to my “brainiac”wife. I do not have a degree yet, and she is working on her second Masters degree. Like I said, she has worked hard to get where she is today. When she successfully passes the state board exam, she will be allowed to teach Special Education classes in South Carolina. We are hoping that this will fulfill her dream of being a full time teacher, working with children with special needs,but will also bring in some extra income to our budget. The trip was relatively uneventful until we got to mile marker 125 when I-26 West bound came to a halt. It took us 90 minutes to make it to mile marker 122 and then we crept in to Columbia doing about 45 mph. Once we got into Columbia and traffic was at a crawl it gave me the opportunity to whip out the iPad and fire up MotionX GPS software. I searched for the address for Days Inn and it gave me two choices. Thinking I had the correct address I chose the first one and clicked the navigate button. We were off to the races, which took us to a very nice private community that had two streets with the exact same street address, and no Days Inn. Katy looked at me when we turned into the gated community, and told me that she thought the GPS was taking us for a spin. Come to find out Katy was right and I did not search for the location correctly. I stopped and searched for the Days Inn first and then verified the address. I was supposed to be in West Columbia, not Columbia. It is nice to have a technology tool but it is equally important to know how to use it. When I woke up this morning I logged on to Wyndham Rewards website and booked a room for the night at Days Inn. I chose this hotel because it has free Wi-Fi, an exercise room and pool. While I was checking in I inquired about the pool and I was told that the pool is out of order. 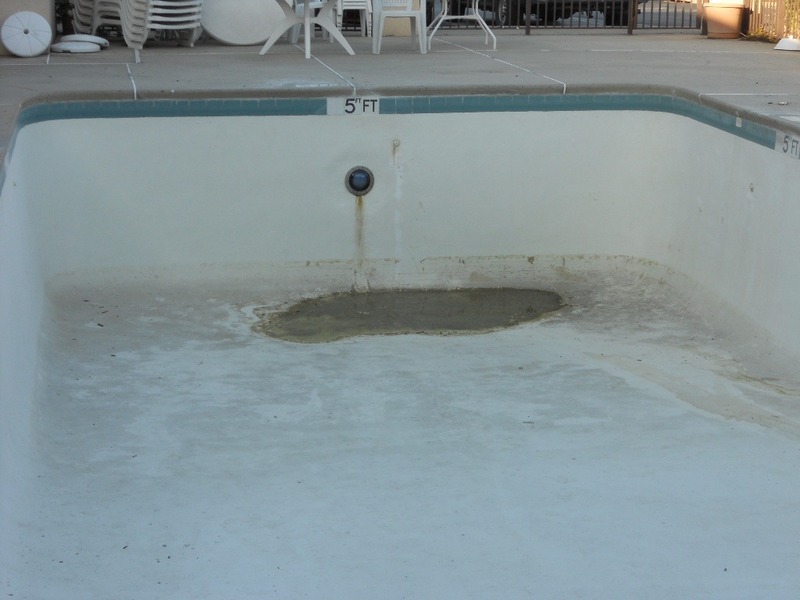 They found a leak in the pool and had to drain it. The pool is buried in the ground and is made of concrete. If the thing is buried in the ground and it springs a leak how do they know? I guess the water comes to the top? 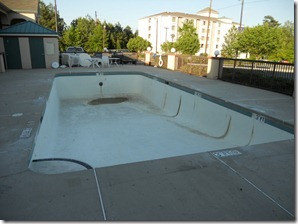 My hopes for some swimming vaporized right along with the water that is no longer there. The only reason we decided to stay is because the free Wi-Fi does work and we are very close to the testing site. We figure we can endure no pool for one night. I went by the exercise room and found out that it has one stationary bike and one treadmill. If more than two people decide to use the equipment someone will have to draw a straw. From the looks of the equipment I bet that it has not been used in quite some time. Have you ever checked in to a hotel and then when you get to the room you find yourself going HMMMMMMM…. ?